Thomas Davies recently arrived in Atlanta for a month long-research trip. 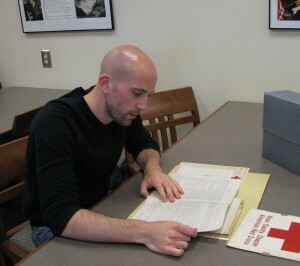 He began his research at Georgia State University Library’s Special Collections and Archives department and is also visiting other archival repositories in the area. Mr. Davies was kind enough to answer a few questions about his research and why it brought him to Atlanta. Which University are you affiliated with and what is your degree/area of research? I am a student at the University of Leeds in the UK and my PhD thesis focuses upon both community groups in the War on Poverty and the Black Power movement in the 1960s and 1970s, how both related to the existing political system and their interactions with municipal electoral politics. Why was it important for you to visit Atlanta? I had to come to Atlanta because the city is one of three case studies I am doing for my thesis. Being an important historical centre in its own right, the vast majority of relevant sources are here in Atlanta and are not available elsewhere. Which archives are you using, and have you found what you’d hoped to find? Have you been surprised? Disappointed? I have used the special collection library at GSU obviously but beyond that I have been to the Auburn Avenue Research Library, the King Center and will be going to the Robert W. Woodruff Library at Emory, the Atlanta History Center, and the Robert W. Woodruff Library at the Atlanta University Center. In terms of my research here in Atlanta, therefore, I am still not half way through yet so it is hard to say whether I have found exactly what I wanted just yet. Certainly I have come across some very interesting material which I think will prove to be very useful to the course of my work and which has raised lots of interesting questions in my mind about events in Atlanta during the period in question. I am yet to be disappointed but have been pleasantly surprised by both the rich collection of oral histories in GSU’s Georgia Government Documentation Project and the excellent resources at the Auburn Avenue Research Library, which is a library that I was unaware of until I arrived here in Atlanta. Where else has your research taken you/will take you? Prior to coming down to Atlanta I was in New York City for 6 weeks which was a fantastic experience and one I am unlikely to forget. After I leave Atlanta I hope to go to Boston for one week to the JFK Presidential Library and then next year, when I return to the U. S., I will be heading to the West Coast to complete the rest of my research. Any observations on Atlanta?I have enjoyed being in Atlanta very much so far – the weather has been very good (especially if you’re an Englishman used to far less desirable weather), the people have been very helpful – with the librarians and archivists I have met being the best example of the famous ‘Southern hospitality’ I had heard so much about (it does exist!) – and the city itself is a fairly relaxed place to go out with plenty of places to eat good food. I have also had the pleasure of seeing bands at both the Tabernacle and the Fox Theatre – two excellent music venues. My final observation would be that the name ‘Robert Woodruff’ is surprisingly (and somewhat confusingly) ubiquitous – I can only assume he was a particularly wealthy and charitable man! This entry was posted in African American Studies, Economics, For Faculty, For Students, General News, History, Political Science, Public Management & Policy, Special Collections & Archives, Uncategorized and tagged georgia givernment documentation project, researcher. Bookmark the permalink. Just out of curiousity, why did you select the Black Power movement?? Any special significance for you, or just a topic that caught your interest? And have you tried getting interviews with Atlantans or other Georgians who were involved with it, or with the Civil Rights movement in general?? Good vote score Tommy D! And I are hear you are enjoying Atlanta’s fine eateries, which we poor Brits cannot come close to competing with (ghetto burgers to do not exist here).